Dog bite tugs of fire hose “Dog Incentive” are widely used for puppy’s attention activation while training and also stimulating drive while educational and free games. Fire hose is a safe and very strong material, resistant to sharp dog’s teeth. This tug dog toy for mastiffs possesses a convenient soft handle, which is securely sewed and can sustain heavy loadings. The shape and size of the tug dog toy are perfect for fetch training, it will be convenient for a puppy to pick the bite tug up from the ground and take it with its mouth. 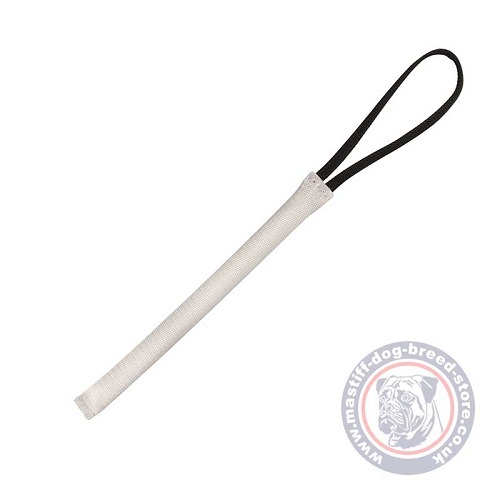 Dog bite tugs “Dog Incentive” are practical and effective instruments for your mastiff puppy or small dog breed progress in trainings. Very well made and durable product. I am impressed with the quality of the material. Great product the build bite drive in a young puppy.